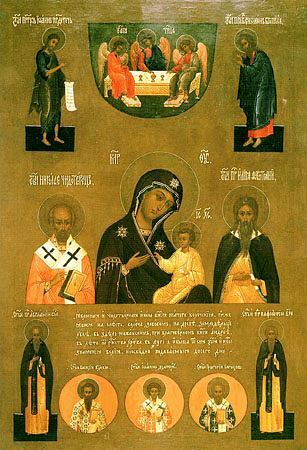 The Koloch Icon of the Mother of God manifest itself in the year 1413 during the reign of Vasilii I Dimitrievich, 15 versts from the city of Mozhaisk, in the vicinity of Koloch in the Smolensk governance. A peasant of this village by the name of Luke found this holy image and took it to his home. One of his household suffered from a crippling of the body. The sick one with faith put his forehead to the icon and received complete healing. This became known of through the surroundings, and many of the suffering began to throng to the wonderworking icon for veneration, and they received graced help from the Mother of God. Luke afterwards took the image to Mozhaisk, and from thence to Moscow. At the capital, Metropolitan Photii, together with an assemblage of clergy and a multitude of the people, met the holy icon. During the carrying of the image through Moscow many of the sick were healed of their infirmities. Later they returned the icon to Mozhaisk. At the place of the appearance of the icon was built a church named for the Mother of God, into which was put the holy image. With the offerings of the peasant Luke and other Orthodox, prince Andrei Dimitrievich built at this locale a monastery, called the Kolochsk or Mozhaisk.